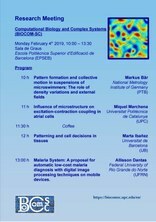 Monday, 4th of February, the Escola Politècnica Superior d'Edificació de Barcelona will hold the annual research meeting of the Computational Biology and Complex System group (BIOCOM-SC) of the physics department. 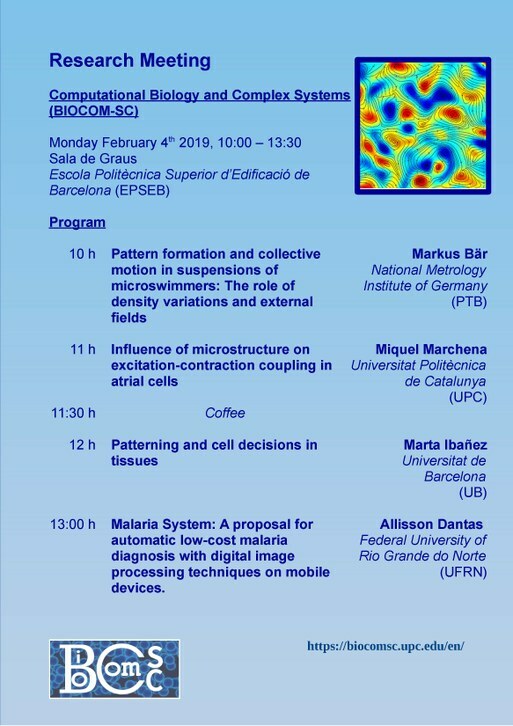 The keynote speaker, Markus Bar, starts at 10:00h in the Sala de Graus of the School with a talk about pattern structures in aggregates of small swimmers. The program continues with the talk of Miquel Marchena, PhD student of the group, on the contraction of atrial cells. After the break, the session restarts with another invited talk by Marta Ibañez from University of Barcelona (UB) about pattern formation in tissues. The day closes with the talk of another PhD student from Federal University of Rio Grande (UFRG) working on Malaria spreading prevention in collaboration with the group. Here on the right you have the full detailed program. Everyone interested is invited to join the conferences.